This risk management seems to revolve around the user’s own self-monitoring, as they seek benefits from sharing ‘fun’ information with their social network, while keeping in mind the potential consequences that could emerge if that same network disapproves of that shared information. By posting acceptable information, participants have described these positives results in terms of social capital. Direct positives on many of these platforms include receiving friend requests and gaining followers, and real-life positives discussed were linked to a person’s increased popularity online. On the other hand, by posting material that is seen as taboo by the online community, users expect to receive negative feedback and possible scrutiny by friends and acquaintances alike. These standards seem to be determined by the online cultures that exist for each platform, and each of these were described as unique social environments. How each person describes their standards and protocol is unique, but below is a rundown of each photo we use and some of the themes that have emerged so far. This section presents the photos used in our elicitation activity, followed by a description of each photo and a summary of many of the responses each has received. In this photo two female subjects are captured sitting side-by-side, with one holding a glass of clear liquid. Outside of these two subjects, we see other bodies present in the background. The photograph is framed on Instagram, accompanied by a series of hashtags (#drunk #BFF #latergram #nightout #lol #lovelife #happy) and emojis. Participants often note that the ages of the main subjects are somewhat ambiguous, with many indicating that the two women photographed seem to be teenagers. A few have suggested that the drinks being held are potentially non-alcoholic, but most assume that they are, given the context of the interview and the text accompanying the photo. For the most part this photo has been seen as somewhat typical, and Instagram users have discussed how they frequently see photos like this within their social network. So, uh, personally I see some of these very often. Uh, people having fun and having fun nights out with, um, alcohol, uh, either being involved in that. So it doesn’t surprise me if I knew these individuals personally. I would assume it’s just another, uh, group of friends that I’m not too close to, that are just having fun on a Friday night or a Saturday night. (076). Some have stated that if they knew the subjects of the photo they might try to contact them and be included in their drinking plans. Notably, most people will note that if men were photographed their positioning and demeanor would likely be different. Some have gone on to note gendered differences in the use of social media, and relate these differences to greater ideas of gendered alcohol use. Although most users seem to acknowledge its common use, Instagram has shown varied responses in terms of protocol, as some people see posting alcohol-related photos as acceptable while others share the opinion that Instagram’s social network is too broad to feel comfortable sharing that information. This seems largely dependent on the participant’s own use of the platform, with some talking about scenarios where family members and professional networks follow an individual, and others only discussing photo sharing between friendly peers. 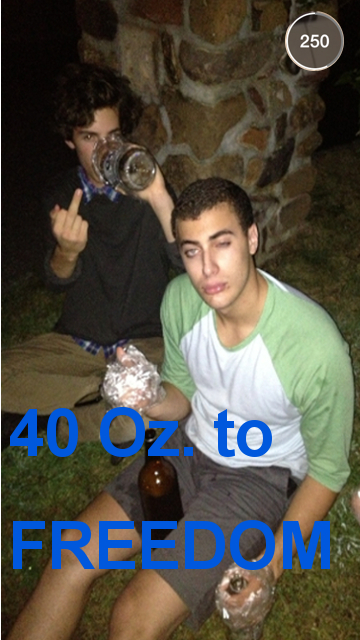 The next image shows two male subjects sitting on a lawn, with three 40 ounce bottles present. While both subjects are looking toward the camera, one is drinking while flipping off the camera, the other has a bottle in his left hand and another placed between his legs and has one eye shut part way. It should be noted that the subject with the two bottles also has his hands wrapped in clear tape, and that the picture is accompanied with large blue text reading, “40 Oz. to FREEDOM”. The photo is embedded as part of Snapchat, which is most clearly recognized by the time wheel in the upper right-hand corner of the photo. 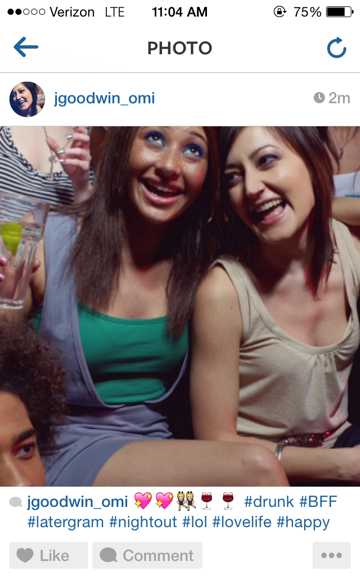 While most have described this photo as fitting for the Snapchat platform, it typically elicits much stronger responses concerning the safety of the subjects compared to the last, and almost all participants have noted that the subjects look heavily intoxicated. The photo becomes especially problematic when participants have been asked to imagine the subjects being female, reflecting a general consensus that women are more vulnerable to victimization when intoxicated. Around half the participants have recognized the drinking activity as Edward 40 Hands, a game where participants tape a 40 ounce beer to each of their hands, and cannot remove the tape until the bottle is empty. Others who did not recognize the tape were confused and assumed that the subject is holding a clear plastic bag or plastic wrap. Not all Snapchat users see this as typical to their personal use of the platform but most acknowledged seeing a photo like this as being plausible, and claim that people seem more willing to share photos and videos of riskier behaviors because of the temporary access others have to this information. When asked for their response to seeing two young women in the photo, participants often indicate that they would be surprised to see two women playing Edward 40 Hands, noting that because women typically have smaller bodies and a lower drinking tolerance it would seem unusual. Women were also talked about as being susceptible to harsher judgement online, and that there exists a double standard for male drunkenness compared to female drunkenness. Participant: I think it looks legit. Um, (hesitates) I don’t know. For some reason, I know that they’re probably like being wild, wild night or whatever. But um, I just see it as they’re having fun, and it’s acceptable. But I feel like if they were girls, they would get judged more. Interviewer: How would you think people would judge them? Some participants note that this view of Snapchat as “temporary” is somewhat misleading and that Snapchat actually stores all shared information on their servers for days before finally removing it. Overall people seem to have fewer issues with seeing these kind of posts on Snapchat over other platforms, and describe it as an “anything goes” online share space. 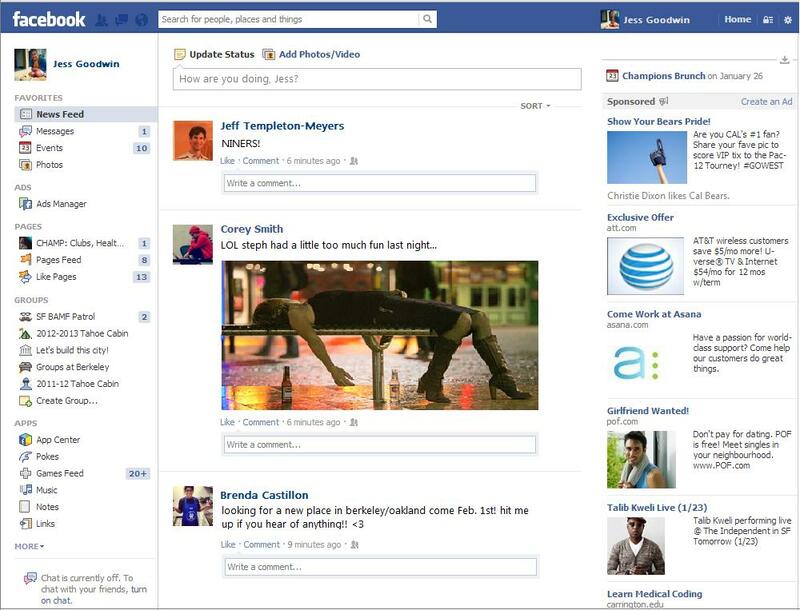 The final photo caries contains the most visual information of the three, being a screenshot of someone’s Facebook newsfeed. The photo of interest captures a scene of a woman lying on a public bench in a supine position, arms limp, head turned away from the camera, with her feet being the only parts of her body touching the ground. The audience can clearly see bottles next to her, and the dark lighting suggests that it was taken in the evening or early hours of the morning. There are also two or three figures out of focus, walking in the background. Posted by “Corey Smith”, the image is accompanied by Corey’s comment, “LOL steph had a little too much fun last night…”. Compared to the first two, this image has been the most consistent in eliciting strong reactions for participants. First, most participants have seen Steph as overly intoxicated and have expressed concern for Steph’s safety. Many of the same participants see Corey’s actions as inappropriate, and claim that he should have helped Steph get off the bench rather than take a photo of her. This shaming of Corey does not happen without an acknowledgement of the photo’s greater context. Some claim that they would feel comfortable with the photo if they knew that he and Steph had a close relationship, although most interpret that Steph is unable to consent to her photograph being taken and see that as an issue. The fact that this photo is presented on Facebook should also be taken into account, since most of our participants have stated that Facebook is generally more risky. These participants worry about whether Steph’s family and potential employers have access to this photo. It should be noted that the majority of participants indicate that the same photo would be more humorous and less taboo if the subject was male instead of female, reflecting both the acceptance of male intoxication and notions of risk for women. Interviewer: What if the roles were reverse, assuming that Corey is a guy? Participant: Yeah, it would be funny. Interviewer: It would be funny? Participant: It would be funny. Interviewer: Why would it be funny then? Generally speaking, participants believe that posting a photo such as this on Facebook is problematic, but disagreement exists between those who see it as taboo and others claiming that these types of photos are typical for the platform. Some have mentioned that in their younger years seeing alcohol-based information and pictures of intoxicated friends was somewhat acceptable, but that the Facebook community has grown to the point where a higher level of self-monitoring is now necessary. Others state that as young adults they’ve undergone a maturation process where they are more careful about their online image. This overlap between alcohol use and social media use has proven to be a topic with rich and varied data, and it seems that the most difficult task will be figuring out which areas of interest to focus on. As we move forward, further questions about online cultures and people’s reasoning behind their use of these online platforms must be addressed. With data from 200 interviews, there are many voices to highlight and figuring out the best way to represent emerging, and often contradictory, themes will be a challenge. There is also a lot to be said about photo elicitation as a qualitative method, and it’s undoubtedly deserving of further discussion. A recent graduate from the University of Washington, Ryan left Seattle in the Summer of 2014 after earning a bachelor's degree in Medical Anthropology and Global Health. Driven by his interest in food systems, he studied a wide range of disciplines and earned minors from the schools of Geography, Public Health, and American-Ethnic Studies. Since November 2014 he has been working as a research assistant for the Center for Critical Public Health's Alcohol and Gender Project.